Incheon International Airport is the biggest South Korean airport which serves most of the international flights to Seoul. The airport itself is very well-organized and is regularly at the top of the world’s best airports lists. Although it is quite far from Seoul, it’s pretty cheap to get to the city center. There are three main options: train, bus, and taxi. To be honest, I would consider only two transport options from Incheon Airport. Train or Limousine Bus. Taxi is too expensive (KRW 50.000+) and I just can’t see any benefit there. 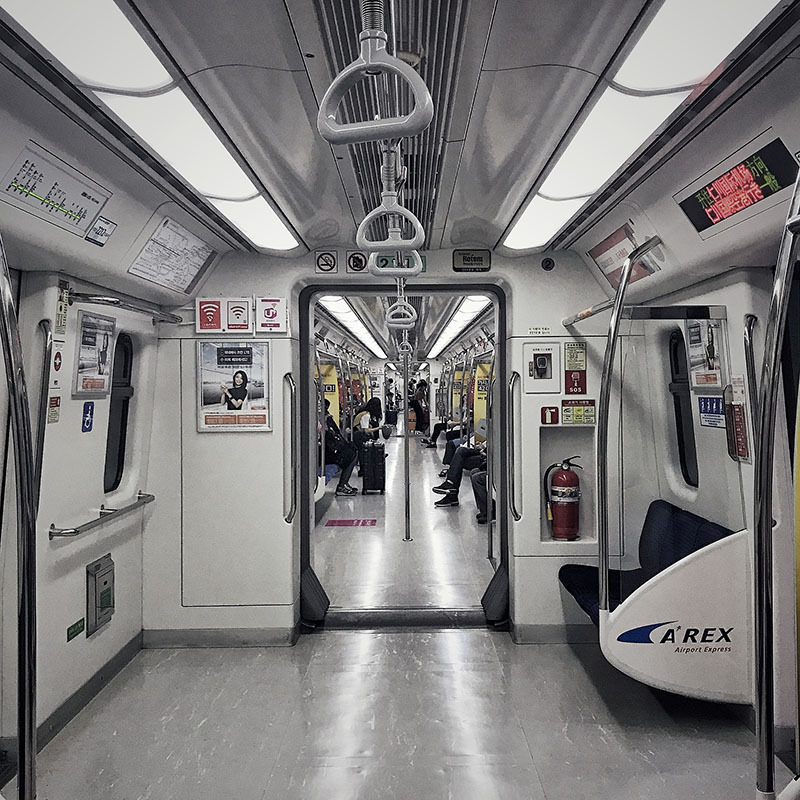 AREX is the fastest means of transportation connecting Incheon International Airport with Seoul Station. There are two types; AREX Express and AREX All Stop train. The time difference is only around 15 minutes, and both options are the fastest way how to get to the Seoul city center. It takes a little bit of walking (5-10 minutes) to get to the train, but the way to trains is very well marked. 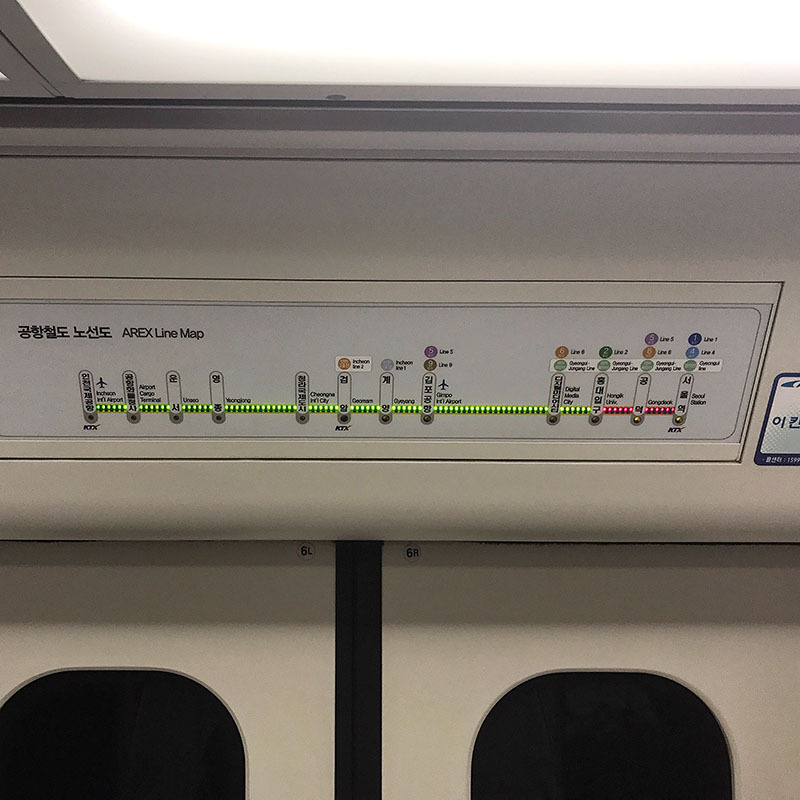 I would recommend to find your accommodation around the AREX route. Hongik University, Gongdeok or Seoul Statio are all interesting areas with an easy connection to the city center for all main sights. 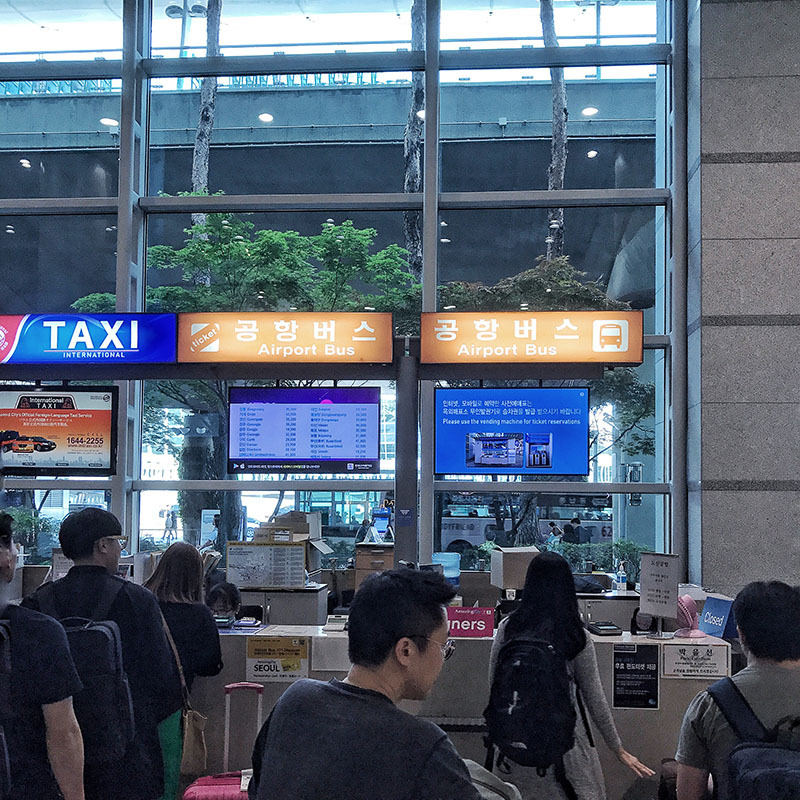 Information Centre, Travel Centre or Ticket machines at the airport or Seoul Station. Centres and ticket machines are very well marked and hard to miss. Discounts (only KRW 6900 per ticket, note: I saw it for KRW 6800 at Seoul Station) for travelers flying with Korean Air, Asiana Airlines, Jeju Air and a few others. 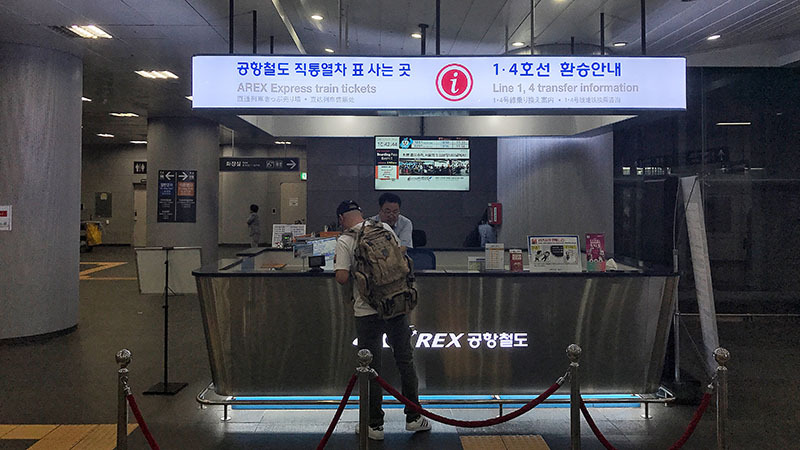 As AREX All Stop is a subway, you can pay with the Prepaid Travel card (T-money) which you use for the traveling around the Seoul. You can buy Prepaid Travel card at any convenient store around the Seoul or Airport Information center and top up at any metro station or at the airport. You can purchase a Single Journey Ticket at the ticketing machines. It will require a deposit of KRW 500 which you will get back when you return the card into the machine. I have to admit that I never used this option as I bought T-Money card from the convenient store. Now and then they release T-Money cards with new designs, so it is also an excellent souvenir. Anyway, after visiting Seoul, you will want to come back again so keeping the travel card could be useful. All the ticketing machines are also in English. I had troubles to top up my travel card with credit/debit cards around the city (I believe they take only cash at the metro stations). However, at the airport, ticket machines take credit/debit cards too (tested). I would recommend to find your accommodation around the AREX route. Hongik University, Gongdeok or Seoul Station are all interesting areas with an easy connection to the city center for all main sights. 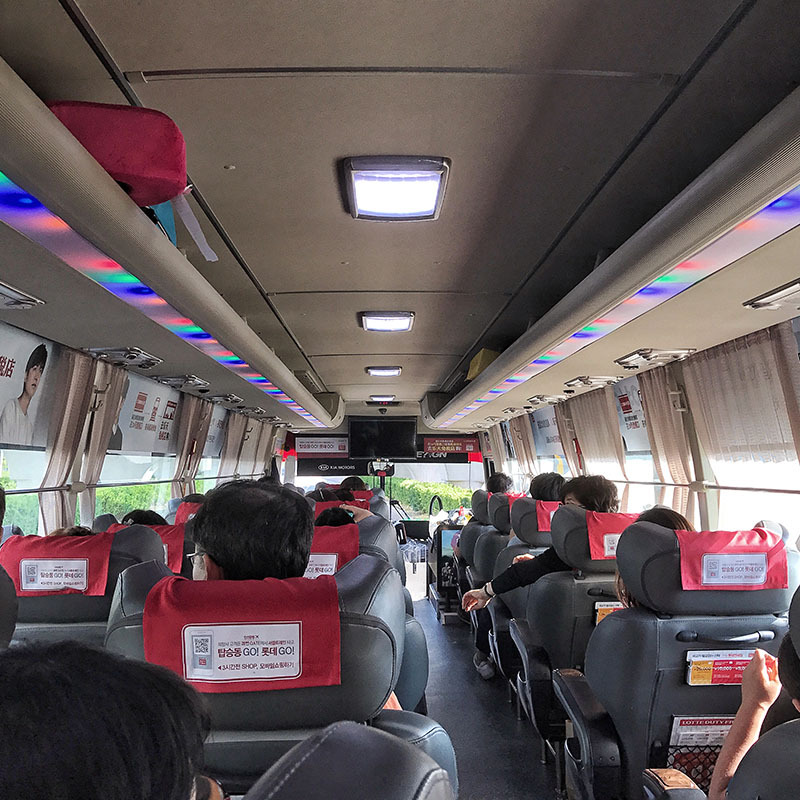 Limousine buses are a great option if you travel to some places which are not close to the AREX route and you would have to change subway lines one or multiple times. Routes of limousine buses connect almost all parts of Seoul. The downside of using the bus is that it can get stuck in the traffic. However, it depends on the area you are traveling to. Sitting two hours in the comfortable seat of limousine bus can be still better than traveling two hours in the subway during the rush hour. Where to buy the ticket? There is ticketing office in the arrivals hall. It is easy to find, and they have a dedicated window for foreigners where you can get all the information in English. The bus stops are right outside of the arrival hall, on the same floor. All the announcements are in the English. However, if you are not sure, I would recommend asking some young Koreans traveling in the same bus for help. They speak English and will gladly help you.